Click on any of them to see a window that tells you the current settings for that targeting option, as well as an 'edit' button that allows you to make changes to your settings. 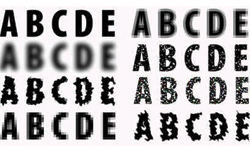 Need to know if you are using these settings? If the icon is grayed out, no settings have been applied to that feature. Here is greater description of the new features offered by Yahoo! 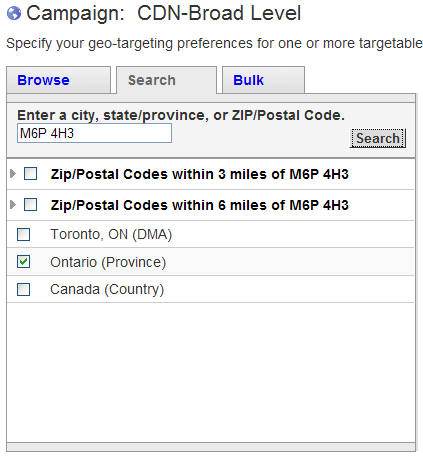 Outside of the country and state/province targeting, Yahoo! now offers the ability to target by ZIP and Postal Codes, DMAs, and individual cities. It's an option that has been available in Google AdWords already and has proven quite useful from many clients with local businesses and limited geographic markets. Probably one of the biggest and best improvements in the Yahoo! Search Marketing program. Advertisers can now schedule their ads to appear in hourly segments, similar to AdWords (who actually have 15 minute segments available). 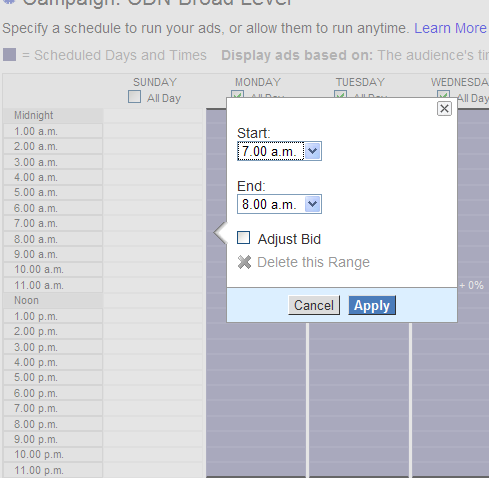 Ads are set to 'All Day' by default, but you came uncheck that option and then choose your own schedule by clicking on that day and setting your schedule in the window that displays. You can also target users based on demographics like age range and gender, and is currently available for Yahoo! sites only. Bids can be adjusted for the ages and genders you wish to target more. For those of you that understand the Google Content Network, this is similar. Yahoo! allows demographic targetting for anyone that has a Yahoo! ID and is on Yahoo! related websites. You can adjust the maximum amount you are willing to pay for each click based on your settings. 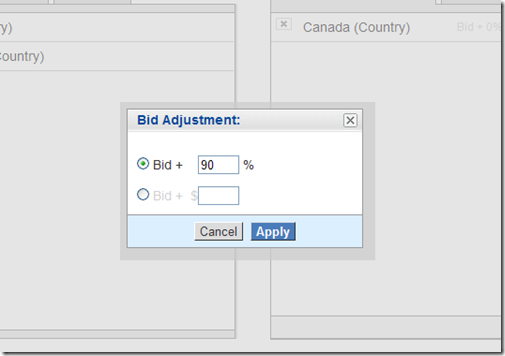 For example, if you wish to bid more for a certain country in your campaign, you can bid an added percentage of your cost per click bid without having to change all bids for all locations or create a new campaign. When you select a region, there is an "Adjust Bid" button beside the location. 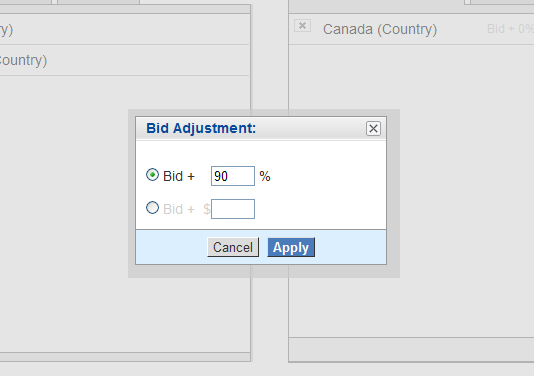 This opens a window where you enter the added percentage that you wish to apply to this per-click bid. 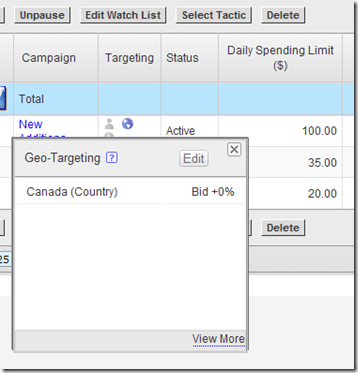 So, if this campaign has a default maximum bid of $1.00 per click, then clicks in Canada will now have a default maximum bid of $1.90. 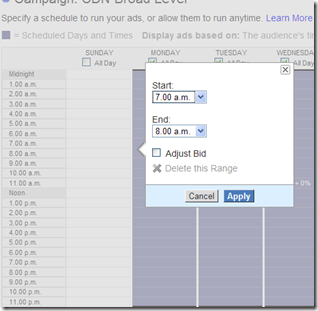 The option is available on all of the targeting features, depending on which setting is most important to your campaign or will be positively affected by such a change to the bid price. Yahoo! 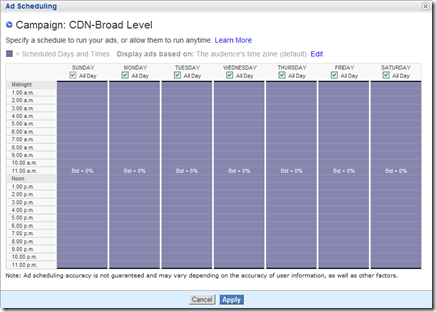 has also improved the technology for content match advertising (where ads on the Yahoo! Content Network are displayed on web pages that have elected to display Yahoo! advertisements in order to monetize their site), making the ads displayed on any page much more relevant to the content of that page. The changes to Yahoo's advertising program are a huge improvement, and we welcome them here with open arms. This gives us much more control over our campaigns and helps us target our audience more precisely and spend budgets wisely. Hats off to Yahoo for these improvements. We haven't been excited to use Yahoo! Search in the previous year because we were not convinced it offered the best CPA options for companies. These features seem to bring it up to par with Bing. While not equalled with Google they are a step in the right direction. It's about time! Yahoo is on its way to getting closer to Google. Though many of these features are replicas of existing ones in the marketplace, the enhanced targeting features are a welcomed addition to the YSM console. 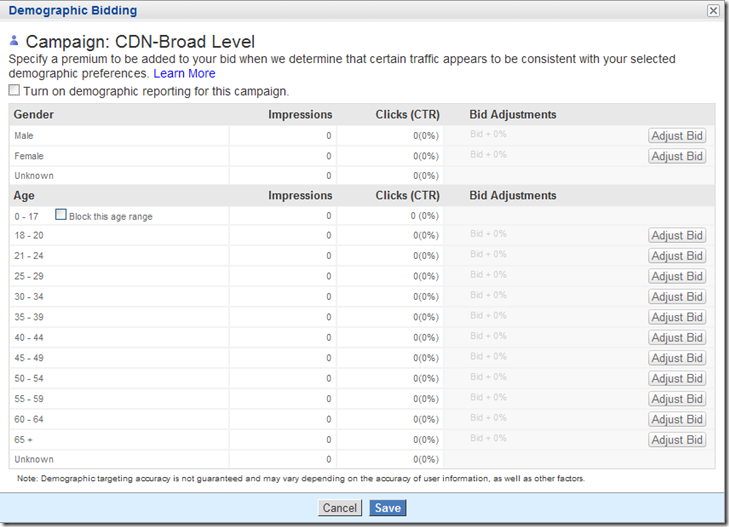 Nice new features, but I think Yahoo Search Marketing(YSM) and MSN Adcenter need to do more to get close to Google. 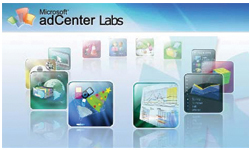 MSN retreated to abysmal depth by killing its Adcenter analytics facility. Pat to Yahoo for coming up with a relief amid MS’s ‘anti-customer’ initiatives. A bunch of smart features, well on target! Well done Yahoo! I think this change will make a big difference, the client can contour their advertising campaign. The right time for Yahoo! to come up with these features. Just the other day Microsoft killed its analytics and today Yahoo! adds to its analytics. Take notice MS! A handshake to Yahoo! for spicing up their marketing tool. True, some of these features have been long awaited. Good that they have finally rolled them out. Now clients can streamline their advertising campaign and hope to gain more returns for their investment. 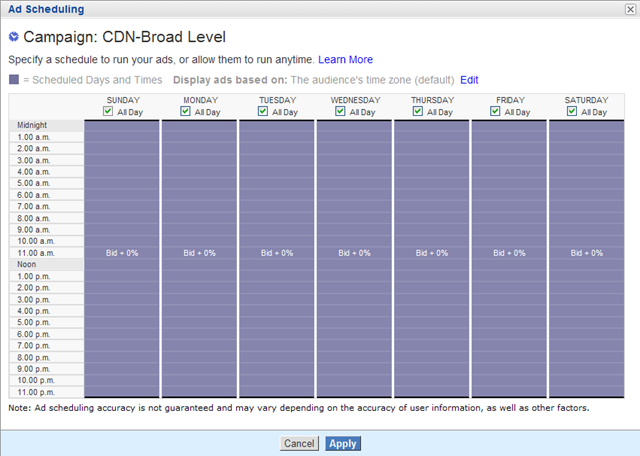 So yahoo has geared up its tempo! 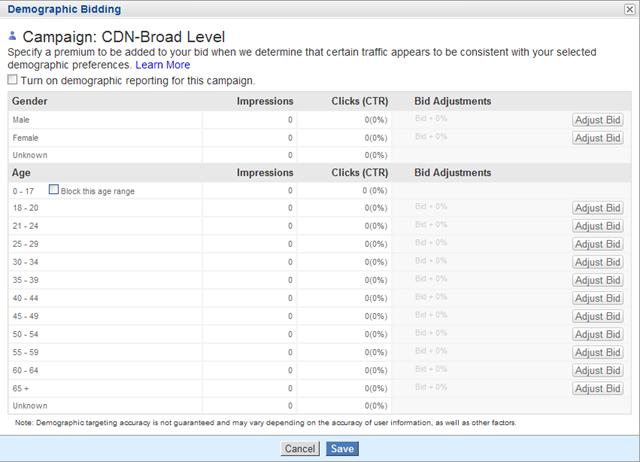 It is on its way to be an alternative to Google adwords. No doubt these new addons will improve the relevancy of ads. Nice new add-ons from Yahoo! there. It is evident that they have put in a lot of thought to come up with these features. There is a certain buzz around Yahoo! of late and it is all for the good I guess. The search marketing industry needs a strong Yahoo! for sure. 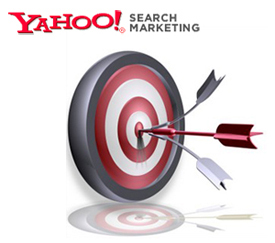 The improvements that Yahoo has made recently in the search marketing programs especially in the ad scheduling part could be a boon for Yahoo in their present difficult times. They have always proved their ingenuity. And for people with creative minds the turn around could come sooner. Yahoo is still recognized for its creativity; there is no doubt on that. The newly introduced features are a mere pointer. And, under a new CEO they have risen from their slumber. It surely won’t be long before they rise up again. In Japan they are performing exceedingly well.